We are pleased to announce that Dr. Nick Velkov will be working out of the hospital on a limited basis. You may see him a couple of times a week performing advanced orthopedic surgeries for Glendale Animal Hospital patients. We’re glad to have Dr. Nick around so we can continue to offer you and your pets the highest possible care. When you see him around, join us in giving him a big Glendale Animal Hospital welcome! 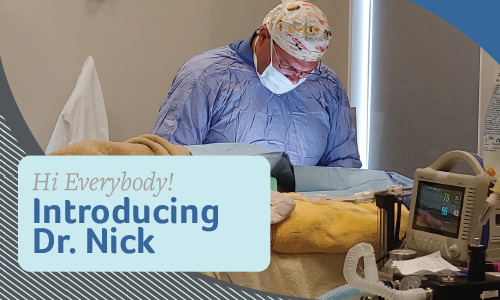 For more information on Dr. Nick and his background, visit his website. If you are intersted in talking with your Glendale Animal Hospital veterinarian on how Dr. Nick may be able to help your pet, please contact us. Doctors are available after 9:00am. For the past 20 years we have had the honor of providing the highest level of veterinary care to Glendale Heights and the surrounding communities. Glendale Animal Hospital is committed to providing excellent care for you and your pet family for many years to come.